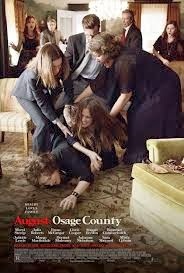 This weekend sees the UK release of August: Osage County, a film adaptation of a play by Tracy Letts (who also penned the delightfully screwed up Killer Joe). With a cast as impressive as this, I couldn't help but anticipate good things. The film depicts the reunion of the Weston family after the father, Beverly's (Sam Shepard) death. His widow, Violet (Meryl Streep) is a sharp and scathing woman who is often off her face on drugs. As her family reconvenes at their childhood home in Oklahoma, old bitterness and resentments resurface, along with potentially devastating secrets. As ever, Streep is entirely convincing as the embittered, drugged up mother of the family, attacking each daughter in turn, but with particular resentment saved for Barbara (Julia Roberts), the one she has never forgiven for leaving home. This might be my favourite of Roberts' performances to date as she portrays Barbara's struggles with a failing marriage and the fear that she is becoming like her mother (she is). Perhaps it's by virtue of the fact that Barbara is a 'hard' character, and one associates Roberts with softer characters, but she is my stand out performance in this film and deserving of her Oscar nomination. The supporting cast are predictably good - Ewan McGregor, Chris Cooper, Juliet Lewis, Julianne Nicholson, Margo Martindale - and the film takes a successful look at dysfunctional family relationships. A special mention must also go to Benedict Cumberbatch (my man of the moment), whose portrayal of the sad sweet Little Charles reiterates his astonishing diversity as an actor. However, at times, the drama was somewhat overwrought, as when Barbara and Violet end up in a physical altercation, and we feel we're just watching a lot of people shouting at one another. Though this is a good film, one cannot help but think that it probably suits its original form better, and I can imagine the intimacy of the stage would bring the material to life in a way it was impossible to mimic on set. Beneath the eyes of a live audience, the material would feel less clean, more organic.